This is the eighth post in a channeling series with the Guides and Angels of the Light… If you would like to start with the first message in this series… Click Here! You have a level of creative control in your reality. You are involved in a complex game, a complex story written according to Divine design. You are here, present in the now, in the physical realm and in a physical body, and you are far more powerful at this time than you are aware. It is your beliefs that you allow to limit you, that limit your power. But the truth of your ability, the truth of the possibility now is anything. With your thoughts, your beliefs and your feelings, you create your outside world. The thoughts, the feelings and the beliefs of all humanity merge to create your experience. And although there are, indeed, millions of humans contributing to this creation, your intentions, your ideas, your wishes and your desires are valid. And you, beloved one, through your awakening, through your becoming more and more aware in the now moment, claiming your power by choosing love, choosing happiness, and focusing your mind on what you do want, you are able to create change on a grand scale in your world. The earth and its inhabitants have been at the same crossroads before. Incredible potential is before you, incredible opportunity for growth. In the past, humanity has chosen fear, chosen destruction, chosen to end the game and begin again. But now, as you empower yourself in this new energy, as you vibrate with love and peace and understanding, you send out the blueprint for an enlightened tomorrow. With your love and happiness, you truly can bring about a great shift in the realm of earth where you live, the process of opening to more and more of your spiritual self, accelerating your energy to vibrate always, and in the realm of love and spirit to vibrate well-being and happiness. With this choice in the now, you truly can create greatness in your realm. You truly can impact all of creation by being positive, by being centered, by being present in the now moment, and by first observing how you respond, how you react and how you perceive your world around you. And then take this a step further and notice the specific beliefs that, indeed, create the foundational world around you. Becoming aware is the first step, and once you are aware, you can take action. Once you know the specific beliefs that are limiting you from your true potential, you can create new beliefs and begin to program your subconscious mind with the version of reality you truly want, bringing you back in line with your plan and your divine blueprint for your life. Thought is not enough. Setting intentions, believing them to be true, feeling good about them, and wanting them in your reality will appear to work occasionally. But understand that attempting to create your reality with thought and feeling alone significantly limits your ability for action is required. It is with the power of your belief, the power of how you perceive your world around you combined with action you take that you can truly create radical and great changes in your individual and collective experience. Great contrast has proven to motivate you and to motivate humanity to create changes. Accepting a corrupt and manipulated government has been the norm, until you collectively reach the point where change must be made. And you are nearing this now. Change is needed in so many areas and avenues of your world. You truly can bring anything you desire into your existence, when you believe it to be so, to be possible, to be in line with you, and then your beliefs, your thoughts and your feelings take on their unlimited power to create. But the core of what you experience, what you perceive, what manifests for you in your life, for the collective species of humanity in reality, all comes down to what you believe. And so, of course, we encourage you to challenge all aspects of your reality, everything you accept and believe to be true without question. This is what you need to evaluate now. Get to the core of your beliefs, and ask yourself, your body, does this really serve me? Is this belief in line with my unlimited nature? Writing down what you believe about your world and then writing a new belief, a new story of how you can create, of what you are able to accomplish, aligns you with your ultimate power as a creative being. Tune in to your heart, to accelerate your vibration. Tune in to your heart and open to bring your physical being into alignment with the new energy, the new consciousness on earth. Be present and be aware. Know that the growth and change you can create will influence the realities across the line of time. You are situated now at a “power point” in reality, a point in which you are unlimited, in which growth, expansion, new knowledge, ability and human potential can rise. This is your destiny, and it also is your choice. It is simple, love or fear. Love motivates you, love raises your energy, love accelerates your vibration and connects you to the realms of love that are present, though hidden among your physical reality now. Choosing love is the path of least resistance to your true objectives and intentions in your world. Choosing fear denies your potential, and choosing to doubt, indeed, limits your ability. Belief, trust, excitement and love about your growth, about what you can accomplish and can manifest will lead you as an individual and as a species. Love will lead you into the paradigm of heaven on earth, which has long waited to return to your planet earth. Time, as you know it, is a very limited view. Expand your mind, open your heart, and be fully present in this now. Breathe and be aware of your breath. Be still and calm in your now. Be present, for from this place of stillness, calm being, your power as a human being is available from the still and calm of the now. You can begin to create and manifest anything in your world you desire. Think big, dream grand, think on a global scale and imagine your world, your life in a state of pure and total love. What does that look like, feel like? An evolutionary shift on your planet is happening, and you are an important part of this shift. There will be a main event, yes. But now, you can choose to integrate these spiritual energies already present on the planet. Claim your seat at the divine throne of love. Radiate love, choose love, manifest love, and love will open doors that you do not even know exist. You have far more potential than you are aware. Release your limitations, your fears and your doubts. And in your now, open your heart, raise your vibration, and move along this path of least resistance towards your highest good, towards the reunion of your physical being with your spiritual body and higher self. You have great power to create positive change on earth. Prepare for this now and begin to use this power to create what you desire. Blessings, joy and love. 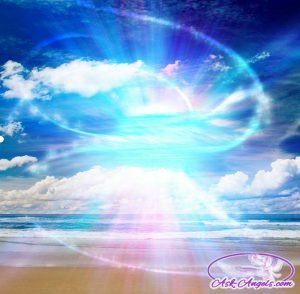 Click Here to continue reading this channeling series with the Guides and Angels of the Light with Part 9- Creating the New Earth. Thank you, very much, for your help, appreciated,God bless.